“Reduce, reuse, recycle”. The adage is old, but it sticks around because it holds true: it is the key to cutting waste and helping make the world a greener place. But what about “refurbish, reuse, recycle”? That’s what engineers from GE Healthcare are doing with previously-owned medical equipment to meet the growing demand for buying and servicing high quality imaging and ultrasound systems at budget-friendly prices. Refurbishing and recycling systems and parts benefits equipment owners and buyers, as well as the environment. No medical equipment lasts forever. At a certain stage in its ownership, equipment is typically replaced to make way for newer, more advanced models. But after being de-installed, machines needn’t be scrapped: they may have life in them yet. When a hospital or clinic decides to part ways with a piece of imaging equipment, GE Healthcare may offer to buy it back through its GoldSeal program. That puts money back in the owner’s pocket. If the system is purchased by GE Healthcare, the company’s service engineers will de-install it and ship it to a GE facility where it will be refurbished or its parts will be harvested for servicing other installed systems. Much of what can’t be reused is recycled, keeping those materials out of landfills. Refurbished equipment from GE Healthcare’s GoldSeal program meets or exceeds the original system specifications, and buyers of GoldSeal MR, CT, or PET/CT products can save around 20 percent of the acquisition costs associated with buying new equipment. In addition, GoldSeal parts are a reliable option for pre-owned parts at an attractive price, and may help extend the lifecycle of aging systems in need of hard to find parts. 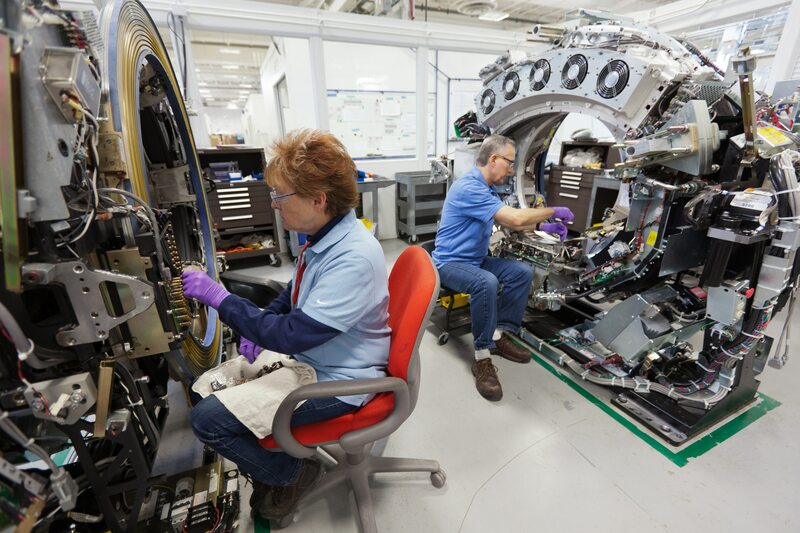 An average retired CT can produce as many as 53 parts, and it takes the team at GE Healthcare’s Repair Operations Center near Milwaukee, Wisconsin about 20 hours to extract them all. About 11 million pounds (that’s around 1,100 elephants) of retired medical equipment and parts are recycled or made reusable each year at the repair center in Milwaukee alone. “GoldSeal benefits all involved in the process. Our customers win when they can improve their ability to care for patients in new ways. GE wins when we find new ways to help customers, thus building or enhancing those relationships,” said Siva Balakrishnan, Executive Product Manager at GE Healthcare.